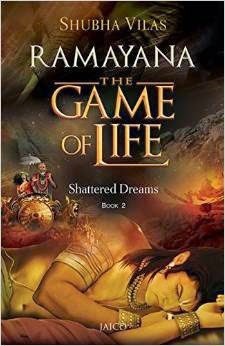 The book “Shattered Dreams” is the sequel to the national bestseller Rise Of The Sun Prince in the spiritual and motivational series Ramayana-The Game Of Life . The cover depicting the agony of the monarch and the evil intentions hiding the beauty of Queen Keikeyi . Beginning from the rise of atrocities of Ravan and need for a savior. Dasaratha’s fear and death. The book ends with the entry of Rama,Sita and Lakshmana into Dandakaranya. The book begins with how Dasaratha was called so and the reason for the boon given to the queen Keikeyi and how he preferred her over his other queens. In this book, one would get to read many untold stories. Clears the doubts from the previous versions of the epic. All of us are familiar with the plot, but what is interesting in this book is it is written in such a way that, there is a take for everyone, person from every walk of life. The story opens with King Dasharatha in the midst of a nightmare so fearful that his whole being shivers, sweat beads line his brows.Was it just a dream or an indication of a bad omen? Dasharatha realizes that age is fast catching up on him and that it is time to hand over the reigns of the kingdom to his son. The natural choice is Rama, as he is the eldest and most able son.. A seed of jealousy starts to sprout within his being but the wise King crushes it down. The coronation of Rama is announced. Preparations begin in full swing. But the joy is only short-lived thanks to the scheming Manthara, Queen Keiyeyi’s hunch-backed maid and the weak-minded beautiful queen. Dreams are shattered. Rama is destined to leave his people and go into oblivion far from his land for 14 long years. The verdict is nothing short of a rigorous life term. Ayodhya ‘s citizen and the city cry but Rama along with his wife Sita and brother Lakshmana take to the forests, ready to face a life full of incidents and learning. The book although seems to be centered around Rama, the author has given a lot of importance to the character of Sita, Bharatha, Lakshmana, Keikeyi,Dasaratha and Sumanthra. Sita, her devotion towards her husband and her reasoning of accompanying her husband to the exile is compelling and brilliant. Her beauty, character and the contrast of her life in the palace and forest beautifully told. The hunch back Manthra, her evil intentions, a lot to learn from her behaviour and the way a drop of poison, pollutes the complete bowl of honey, she cunningly pitted the beautiful queen Keikeyi against her husband the entire kingdom. The book depicts the role of karma in one’s life. The enigmatic prince Rama’s tales and the various characters in his life teach every one of us principles of life. Teaches us how to deal reversals positively. Bharatha teaches us how to handle temptations and love selflessly and believe in what you think is right. Through Sita’s courage one can learn how to explore beyond comfort zone and how effectively to adopt to changes. Characters well etched with their own set of perfections and imperfections. Characters are set in such a way that we can relate to it. Language is simple and elegant. The book keeps you glued through out. The take from each character , the lessons for life ,brilliantly told and a must read.